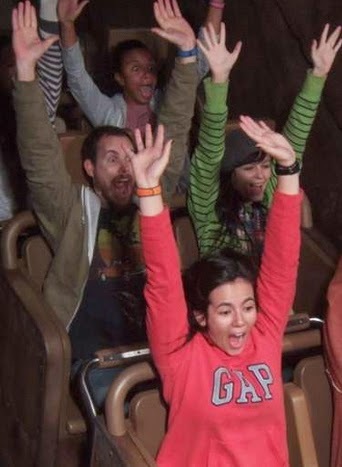 Do you ever wonder, with all your trips to Disney parks, how many random strangers have random photos and video of you? Think about it - all the times you walked into someone's photo because you didn't notice the guy several feet away snapping a pic, or the many, many more times you walked behind a group posing. All the on-ride pictures, where your Splash Mountain log is filled out with any number of people you don't know, and on Expedition Everest when the girl in front of you put her arms up too and her hand is covering your face. How many dads with video cameras have panned the crowd and captured your likeness? How often, really, do you show up on YouTube??? I wonder about that sometimes. And I looked forward to the day that I post a photo with a face you recognize - or maybe the other way around! Have you ever found yourself or someone you know in someone else's photos? That's kind of a.......creepy thought actually. We are all creepers and creepees!